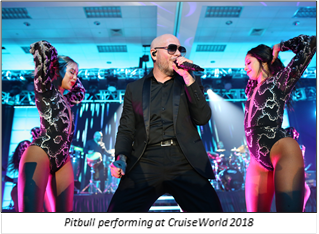 Last night, Grammy Award®-winning artist Pitbull performed at an exclusive reception hosted by Norwegian Cruise Line, the innovator in cruise travel, at the 2018 CruiseWorld conference held in Ft. Lauderdale, FL. The event was a testament to the company’s commitment to providing exceptional experiences including world-class entertainment. Armando Christian Perez, known globally as Pitbull, took to the stage giving a show-stopping performance to a packed room of attendees from across the travel and tourism industry. Known for his upbeat, Latin-influenced songs, Pitbull rocked the stage with his greatest hits, including “Don’t Stop The Party,” “Feel This Moment” and “Fireball”. The high-energy event was true to Norwegian Cruise Line, showcasing the brand’s dedication to breaking the boundaries of all that is associated with traditional cruising. Globally-renowned for his music, Pitbull has been an integral partner of Norwegian Cruise Line since 2015, when he became Godfather of Norwegian Escape, the first ship of the Breakaway Plus Class – the most successful class in the company’s history. Since then, he’s been an advocate of the brand’s philosophy of providing guests with the freedom and flexibility to design their ideal cruise vacation. He has hosted several music festivals at sea, including The Pitbull After Dark Party aboard Norwegian Pearl and Jade, in partnership with Sixthman, the industry leader in music festival vacation experiences. Pitbull also made a surprise appearance at the christening festivities of Norwegian Bliss, the newest ship within the cruise line’s fleet.